At DBS, we'd like to help you find the best solution to your foundation problem. We can perform a comprehensive inspection of your foundation, providing a professional consultation and a written cost quote. If you'd like to schedule a free foundation repair quote, call or e-mail us today! Soil layers tell a story at this building site Grand Rapids. At DBS, we are proud to be a respected member of the Supportworks international contractor network and to have our employees trained through the International Headquarters in Omaha, Nebraska. Supportworks is a leading designer, manufacturer, and distributor of foundation stabilization systems for new and existing residential, commercial, and industrial structures. 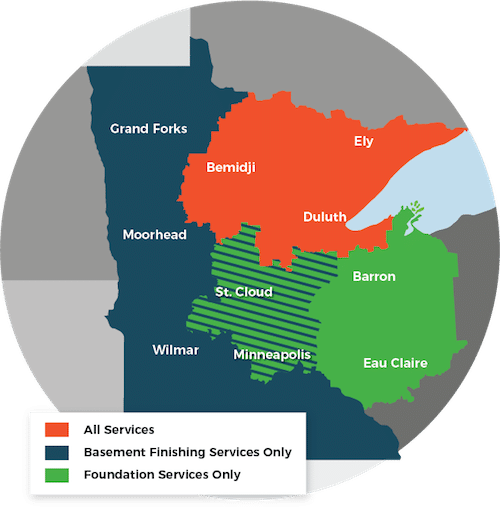 Call Us For A Free Foundation Quote In Minnesota and Wisconsin! We proudly serve the Minnesota and Wisconsin area, including Superior, Duluth, Minneapolis, and many areas nearby.